The U.S. figures prominently in the world of horrific stats, as do many other countries. Perhaps the most significant difference between these, however, is the fact that the U.S. claims high moral grounds when it comes to the rest of the world, despite having its own house out of order. Here is one example: the U.S. often positions itself as the society based on two (amongst others) core ethical principles: law and order, and public support for ethical norms. Now, if the two values are taken together, the proposition would imply that the U.S. has law & norms-abiding citizenry (the average crime rate should be below that of the countries the U.S. lectures), plus a functioning legal system (the punitive system of justice should be functioning alongside the preventative and rehabilitative functions). 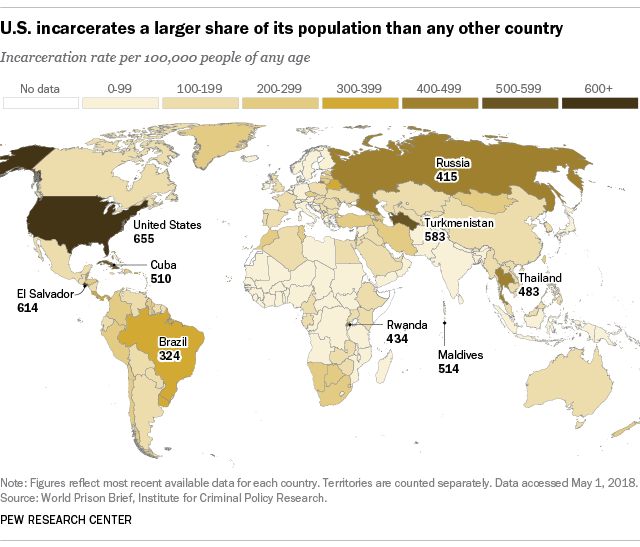 In conjunction, the three factors should combine to yield a relatively benign incarceration rates in the U.S. compared to other countries. Either (A) the U.S. justice system is highly effective in capturing and convicting criminals (large prison population being driven by law enforcement efficiency), or (B) the U.S. justice system is highly ineffective in preventing crime and rehabilitating criminals (large prison population being driven by failure of the justice system in its other key functions), or (C) the U.S. population has high rates of disdain for law and order, criminality and recidivism. What is impossible is that 'Not (A)' can simultaneously coincide with 'Not (B)' and 'Not (C)'. In other words, what is impossible is the very claim of U.S. exceptionalism as a society with highly effective and functioning democratic law and order institutions while, simultaneously, being a law and norms-abiding society. Thus, any analyst rating the U.S. legal system as being highly functional must simultaneously allow for the U.S. society to be disrespectful of laws and norms. Alternatively, any analyst claiming that the U.S. society is norms and laws-based must simultaneously allow for the U.S. justice system to be of low quality. One or the other, logically, applies. "Global governance requires rules, because flexibility and goodwill alone cannot tackle the hardest shared problems. With multilateralism under attack, the narrow path ahead is to determine, on a case-by-case basis, the minimum requirements of effective collective action, and to forge agreement on reforms that fulfill these conditions." Can Multilateralism Adapt?, Jean Pisani-Ferry. Monetary sovereignty in the form of free capital mobility, with international political stability and political autonomy of democratic systems. In simple terms, free capital mobility means that capital flows will reflect economic and demographic conditions prevailing in the specific society. If these conditions deteriorate, triggering capital outflows (perhaps due to monetary accommodation response to ageing population), the society can respond either through imposing capital controls (preserving its standing in international political institutions, and allowing its democratic institutions to remain robust) or it can pursue non0-democratic suppression of its own population (allowing capital to flow out of the economy and not imposing cost of resulting economic decline onto international partners). Alternatively, the country can continue allowing outflow of capital and retain democracy by blaming the external shocks and restricting its engagement with international political institutions. 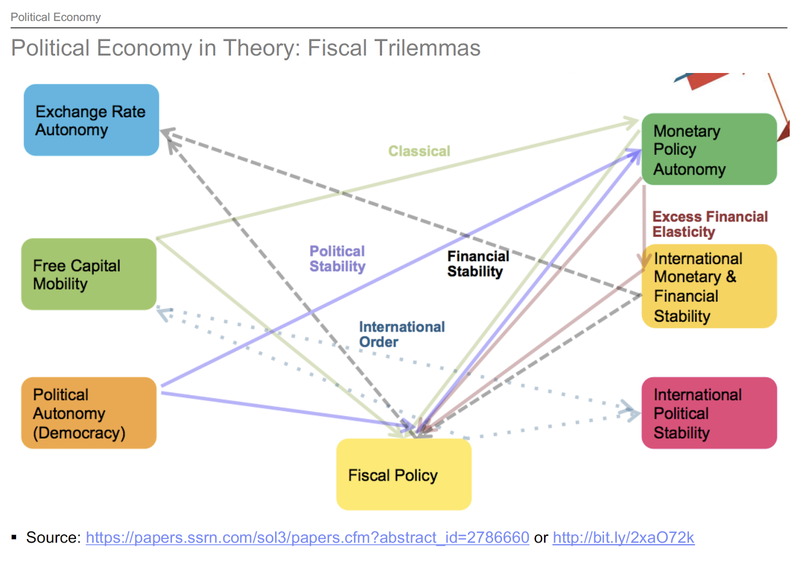 Fiscal sovereignty in the form of free capital mobility, international political stability and autonomous fiscal policy. 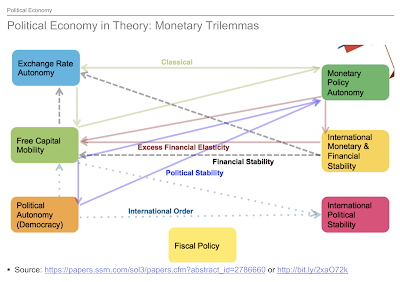 In simple terms, the above monetary sovereignty simply transfers democratic autonomy failure to fiscal policy failure. For more academically inclined readers, here is my paper summarising these Trilemmas and putting them into the context of the euro area harmonisation: Gurdgiev, Constantin, Euro After the Crisis: Key Challenges and Resolution Options (May 30, 2016). Prepared for: GUE/NGL Group, European Parliament, October 2015: https://ssrn.com/abstract=2786660. It is, generally, not hard to find examples of the two trilemmas presence in a range of historical shocks in the past. More recent examples, however, are harder to come by due to time lags required to see these trilemmas in action. Pisani-Ferry's quote above hints at such. 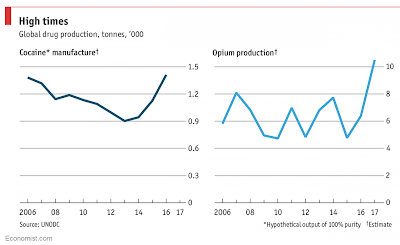 During the 1990s, "After an eight-decade-long hiatus, the global economy was being reunified. Economic openness was the order of the day. ...The message was clear: globalization was not just about liberalizing flows of goods, services and capital but about establishing the rules and institutions required to steer markets, foster cooperation, and deliver global public goods." As Pisano-Ferry argues, today, "Despite a decade of talks, the global trade negotiations launched in 2001 have gotten nowhere. The Internet has become fragmented and could break up further. Financial regionalism is on the rise. The global effort to combat climate change rests on a collection of non-binding agreements, from which the United States has withdrawn... The very principles of multilateralism, a key pillar of global governance, seem to have become a relic from a distant past." "...let’s face it: today’s problems did not start with Trump." In fact, the problems started with the above trilemmas. Or put differently, the problems are not an outrun of bad policies or choices, but the natural result of the impossibility of combining the conflicting policies objectives and institutions. "There is no shortage of explanations. An important one is that many participants in the international system are having second thoughts about globalization. A widespread perception in advanced countries is that the rents from technological innovation are being eroded precipitously... A second explanation is that the US strategy toward Russia and China has failed... neither Russia nor China has converged politically... Third, the US is unsure that a rules-based system offers the best framework to manage its rivalry with China. [and]... Finally, global rules look increasingly outdated. Whereas some of their underlying principles – starting with the simple idea that issues are addressed multilaterally rather than bilaterally – are as strong as ever, others were conceived for a world that no longer exists. Established trade negotiation practices make little sense in a world of global value chains and sophisticated services. And categorizing countries by their development level is losing its usefulness, given that some of them combine first-class global companies and pockets of economic backwardness." In simple terms, the world became more complex and more fragile because we tried to make it less complex and more centralized (hegemonic positioning of the U.S. in Bretton Woods setting), while making it also more multilateral (through financial, economic, trade and human capital integration). Pisano-Ferry offers a 50,000 feet level view on the solution to the problems: "the solution is neither to cultivate the nostalgia of yesterday’s order nor to place hope in loose, ineffective forms of international cooperation. International collective action requires rules... The narrow path ahead is to determine, on a case-by-case basis, the minimum requirements of effective collective action, and to forge agreement on reforms that fulfill these conditions." In other words, one cannot tackle trijemmas directly (correct view), but one can defuse them by limiting each node of the desired policies. E.g. less democracy here - to offset pressure from demographic of ageing, less capital mobility there - to reduce the speed of capital flows across the borders and lower volatility of financialized investment, less fiscal sovereignty - to provide better buffers for shocks arising in financial and economic systems, and less international institutions - to allow for more flexible rebalancing of monetary, trade and fiscal policies. The problem with this is it requires for the hegemony (the U.S.) to put a hard stop to imposing its preferred solutions onto the rest of the world and international institutions. Or, put differently, the hegemony must stop being a hegemony. Good luck squaring that with American vision of the world a-la Rome 4.0. The EU27 have a new 'deal'. This time, on revamping the block's migration strategies in the face of continued relentless wave of refugees fleeing to Europe from Syria and North Africa, propelled or aided to take desperate actions by the regime change doctrine of Washington. Migration numbers are down roughly 90 percent from their peak in 2015, and fell 45 percent y/y in the first half of 2018. But, voter revolt against the system that is perceived as "open borders" is still fuelling rise in political opportunism and extremism across Europe. The latest catalysts for the negotiations have been: (1) the rise of anti-immigrant parties in Germany that now threatens the uneasy governing coalition in Berlin, and (2) the arrival to power of the new, anti-immigration coalition in Italy. To be more precise, Italian Government has been asking for the EU to take "concrete steps" to share burden of accepting refugees with Italy for some time now. Other catalysts have been governments of Hungary and the Czech Republic, where current political leadership has been opposing the EU policy of imposing automatic quotas for accepting migrants. Earlier today, following almost nine hours of negotiations, the EU27 finally hammered out a compromise deal, immediately labeled in the media as 'political fudge' - something the EU has been very skilled at achieving for a good part of the last 20 years. To prevent Italy from exercising a veto on the deal, the EU agreed to redistribute arriving migrants away from the country of their original landing to "control centres" spread across the EU. Centres locations are to be specified later. "Control centres", funded out of unspecified funds, but presumably payable by the joint resources of the EU, will de facto trade 'local jobs and euros' for communities accepting large scale migrants detention centres. This model works well with military bases and jails, and can be attractive to some poorer Eastern European countries, as well as countries like Greece and Italy. The key to this is that the detention centres will only be located in countries that volunteer to accept them. In simple terms, immigration policy is now a part of fiscal redistribution scheme, just what Italy wanted. "Control centres" will function as a triage point, with “rapid and secure processing” separating economic migrants from those with a potentially legitimate claim to the asylum. Thereafter, successfully pre-screened asylum seekers will be distributed under the principle of solidarity (quotas), although, in a bow to Czech and Hungarian governments, solidarity principle will apparently be voluntary too. In other words, "rapid" processing will likely end up being a 'lengthy detention' in "control centres", as many Governments will simply refuse to take in asylum seekers, while other Governments will end up being swamped with applicants. To restrict the numbers of those reaching the EU borders in the first place, the EU meeting agreed to provide more funds for Turkey and Morocco to act as buffers for refugees. Algeria, Egypt, Libya, Morocco, Niger and Tunisia are to get funding for setting up 'processing centres'. Or, put differently, the EU will be paying more to warehouse migrants offshore, something that is likely to lead to lengthy detention in questionable conditions. As a support for embattled Angela Merkel, the agreement also states that the nation states can “take all necessary internal legislative and administrative measures” to stop refugees and migrants crossing Europe’s internal borders. Whatever this means for the Schengen agreement and borderless travel, time will tell. My view: The migration agreement is nothing more than another kick to the proverbial can that was stuck in the cracks on the proverbial road toward addressing the migration crisis. It fails to address actual modalities of asylum process, the key being the length of the process, lack of alternatives to highly costly and questionable (in ethical and even international law terms) deportations of failed seekers, and the lack of clarity of rules and resources for allocating successful asylum seekers. It also failed in effectively dealing with migrants inflows: a 'buffer zone' on the southern shores of the Mediterranean simply increases costs of making the crossing, and thus increases the risk of crossing to migrants. It does not remove the incentives for making the journey. In the case of Libya and Egypt, there are questions about these states' capacity actually control their borders, primarily arising from the nature of the Government regimes in both countries. In case of Syria, ability to seal off inflows of refugees from the country hinges on stabilisation of the Assad regime, as no other participant in the Syrian civil war has any interest in controlling Syria's Mediterranean coast. In effect, the EU agreement does not tackle the main issue at hand: how to reduce the inflows of both economic migrants and refugees into Europe. Likewise, the EU agreement does not even touch upon the need to structure effective measures (legal and institutional) to improve integration of the successful migrants into the European societies. In short, we will be back to this issue soon. Mark my words. In three and a half years, the world debt has gone from being a worry to a bubble. At the end of 2014, there were just under $44 trillion worth of corporate and government debt on issue with roughly 1.4 percent of these yielding negative rates. 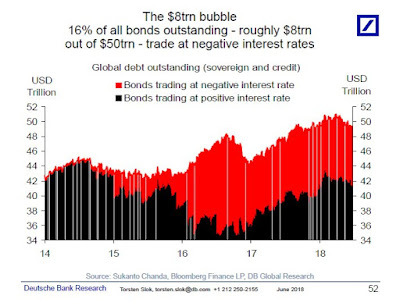 As of June 2018, there are now more than $49 trillion worth of corporate and public sector bonds in the markets, with ca $8 trillion of these (or 16 percent) trading at negative yields. And this is just a part of the overall debt bubble picture. In April this year, the IMF report noted that non-bank funding for households and wholesale lending "is on the rise since the Lehman-crisis, and constitutes a major source of bank credit to the economy" (see https://www.imf.org/en/Publications/WP/Issues/2018/03/19/Leverage-A-Broader-View-45720). IMF estimates for non-bank funding for the U.S. banks alone, shown below, add $11.7 trillion to the debt system in 2016, against $10 trillion in 2008. Meanwhile, another roughly $8 trillion worth of non-bank debt is sitting in the dealer funds and hedge funds' pledged collateral exposures. Meanwhile, in the U.S. alone, $6.3 trillion corporate debt bubble is now at a risk of rising interest rates. U.S. speculative-grade corporate borrowers are now at a new record-low cash-to-debt ratio of just 12 percent, below the 14 percent in 2008. Worse, per S&P report, more than 450 investment-grade companies that are not in the top 1 percent of cash-rich debt issuers, have highly risky cash-to-debt ratios of around 21 percent. 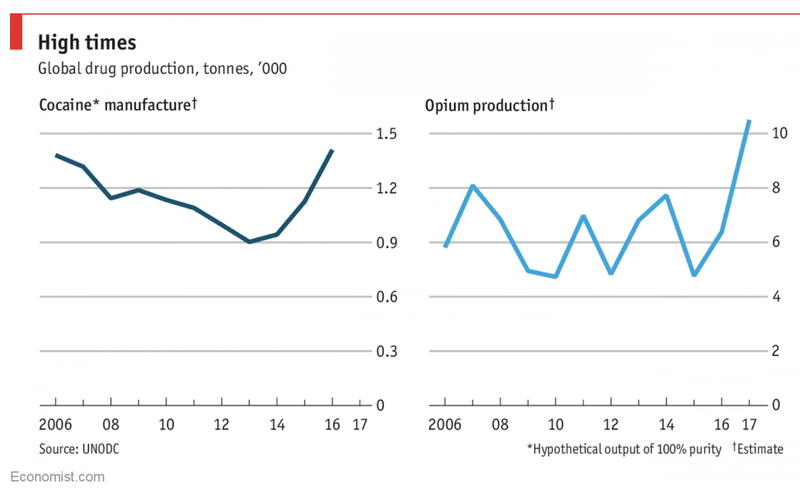 While the U.S. war in Afghanistan drags closer to marking 17th anniversary, and the U.S. war on drugs in Latin America rages into its fourth decade (the U.S. has spent more than 1 trillion dollars since the mid 1970s combatting narco-mafias in Latin America), global drugs trade is booming. For background on the U.S. policymakers' surprising inability to learn from their own failures: http://trueeconomics.blogspot.com/2018/05/12518-us-war-in-afghanistan-when.html. 25/6/18: Wilbur Ross: The MAGAlithic Cat Fish of Washington's Swamps? The 'hero' of the Irish banking sector bailouts, Wilbur Ross, formerly of Bank of Ireland and Bank of Cyprus fame, a dude who would have made the podium in bottom-fishing were it ever designated an Olympic sport, and currently, the MAGAlithic U.S. Secretary of Commerce is now also a subject of the criminal and ethics complaints filed on June 22, 2018 by Citizens for Responsibility and Ethics in Washington (CREW) with the Department of Justice (DOJ) and OGE: https://www.citizensforethics.org/press-release/wilbur-ross/. Swimming in the cleaned up waters of the drained Washington Swamp, Mr. Ross, has actively sought to inject unwanted and unwarranted 'transparency' not into his own dealings and disclosures, but into... U.S. Census 2020, earning him another set of law suits: "In March, Ross ordered that the 2020 Decennial Census include a question about the citizenship of all U.S. residents for the first time since 1950 — leading to a slew of lawsuits around the country..." (see https://nypost.com/2018/06/06/wilbur-ross-sued-over-citizenship-question-on-2020-census/). Mr Ross has been now accused of insider dealing in Bank of Ireland: http://www.businessinsider.com/wilbur-ross-accused-of-insider-trading-with-irish-bank-stake-2017-12, and his firm was fined by SEC for improper disclosures of fees it charged the investors: https://www.reuters.com/article/us-wlross-sec-idUSKCN10Z2YJ/ and was sued for overcharging: https://www.wsj.com/articles/wilbur-ross-sued-over-fees-by-firms-former-executives-1510793229. Then, there are shady issues with Mr. Ross' past involving U.S. steel companies: https://theintercept.com/2018/03/05/steel-tariffs-wilbur-ross-pollution/. And on... and on... and on... Often described as a Wall Street 'shark', the dude is really a giant cat fish, enjoying murky waters of the Washington's mud beds. 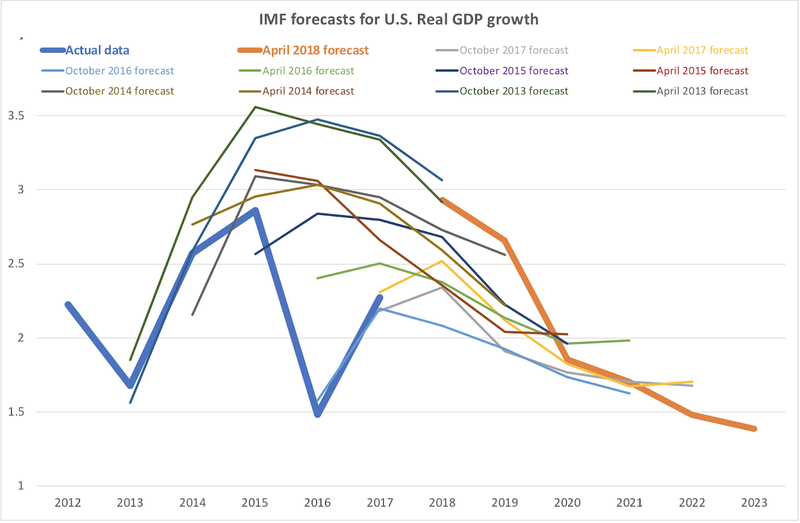 In recent weeks, the IMF came under some criticism for posting relatively gloomy forecasts for the U.S. economy, especially considering the White House rosy outlook that stands out in comparison. see for example, WSJ on the subject here: https://www.wsj.com/articles/imf-sees-u-s-potential-growth-at-half-the-pace-of-white-house-estimates-1528995732. 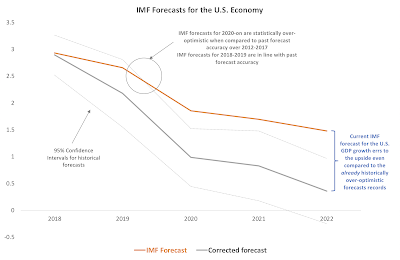 Are IMF forecasts for the U.S. economy actually any good? 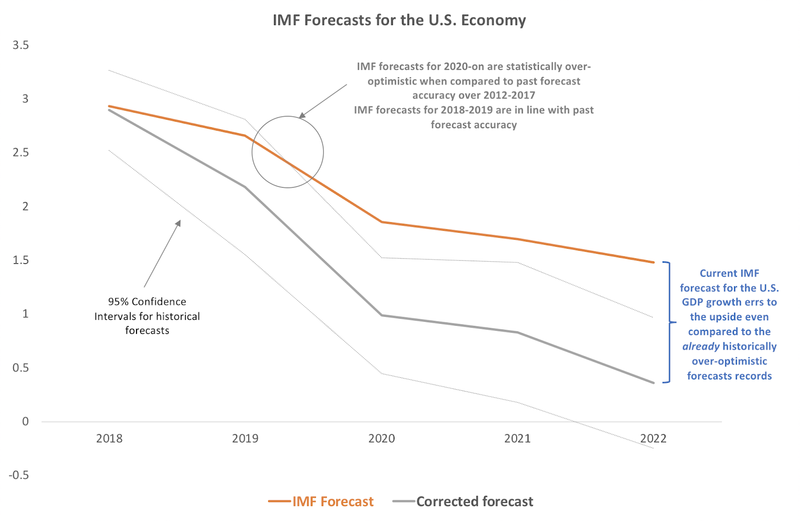 Per above chart, the IMF is not alone in being less than exuberant about forward growth forecasts for the U.S. In fact, it is White House that appears to be an outlier when it comes to 2020-2023 outlook. What does the data tell us? 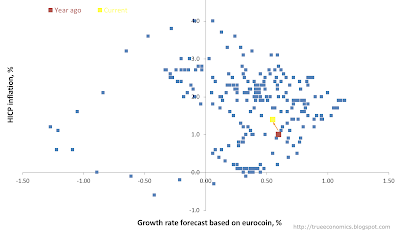 It says that IMF forecasts have, on average, overstated actual growth outrun. In other words, IMF forecasts have been over-optimistic, not excessively pessimistic, in the recent past. More that that, IMF's current (April 2018 WEO release) forecast for the U.S. GDP growth is even more optimistic than already historically optimistic tendencies of the Fund imply. 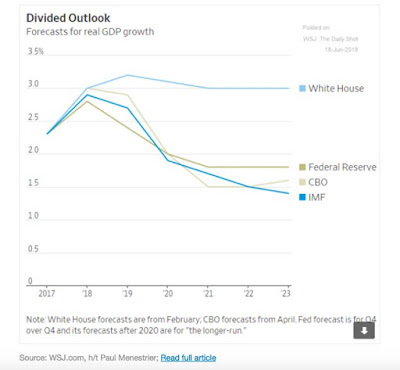 In other words, even though the first chart above shows the IMF forecast for the U.S. growth to be pessimistic, compared to that of the White House, in reality, IMF's forecasts tend to be wildly optimistic. Average error for 1 year ahead forecast for the U.S. in IMF releases has been 0.037 percentage points (very small), rising to 0.476 percentage points for 2 years ahead forecasts (more material error), and 0.867 percent for 3 years ahead forecasts. Augmenting data (to achieve larger number of observations to 2000-2006, 2011-2014 periods, 4 years ahead average forecasts has been 0.867 percentage points above the outrun growth. And so on. IMF's forecasts more than 1 year out should be treated with some serious caution - something that applies to all forecasters. 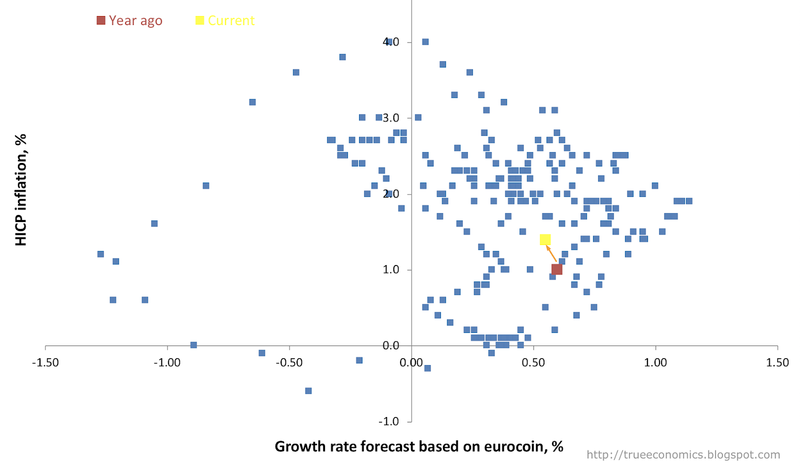 On balance, we now have three consecutive months of declining Eurocoin-implied forecasts for euro area growth. 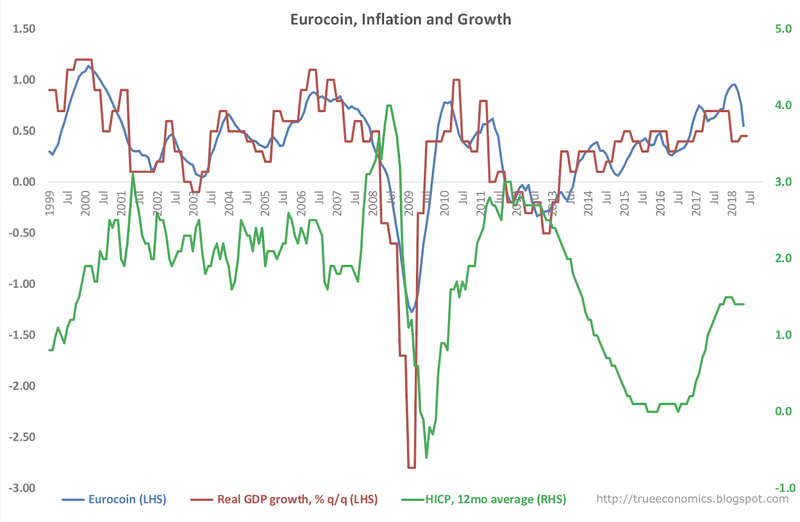 It will be interesting to see eurocoin print for June, coming up in about a week, as well as July (coming out prior to the Eurostat growth estimates for 2Q 2018). 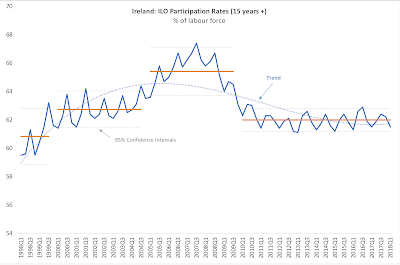 As the chart above shows, despite low and falling unemployment, Irish labour force participation rate remains at the lows established at the start of 2010 and is not trending up. In fact, seasonal volatility in the PR has increased on recent years (since 1Q 2016), while the overall average levels remain basically unchanged, sitting at the lowest levels since the start of the millennium. Taking ratio of those in the labour force to those outside the labour force as a proximate dependency indicator (this omits dependency of children aged less than 15), over 2000-2004 period, average ratio stood at 1.685 (there were, on average, 1.685 people seeking work or employed for each 1 person not in the labour force). This rose to 1.895 average over 2005-2009 period, before collapsing to 1.630 average since the start of 2010. Current ratio (1Q 2018) sits at 1.600, below the present period average. 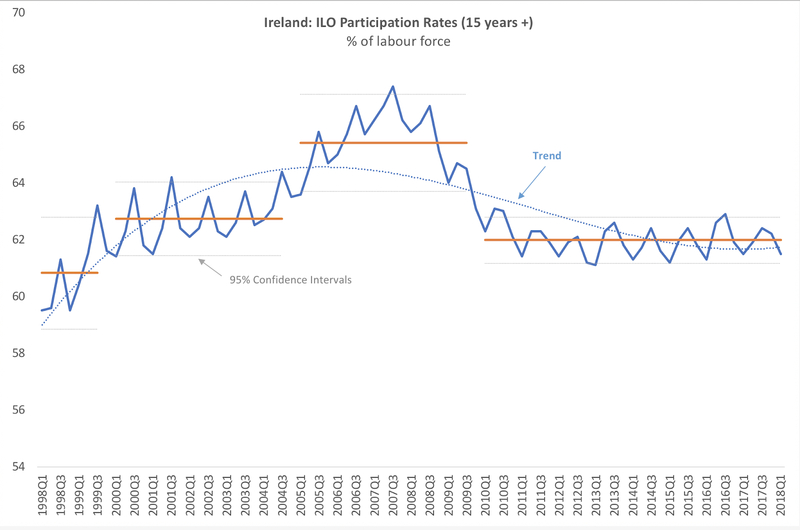 While demographics and education account for much of this, overall the conclusions that can drawn from this data are quite striking: per each person staying out of the labour force for various reasons, Ireland has fewer people working or searching for jobs today than in any comparable (in economic fundamentals terms) period. 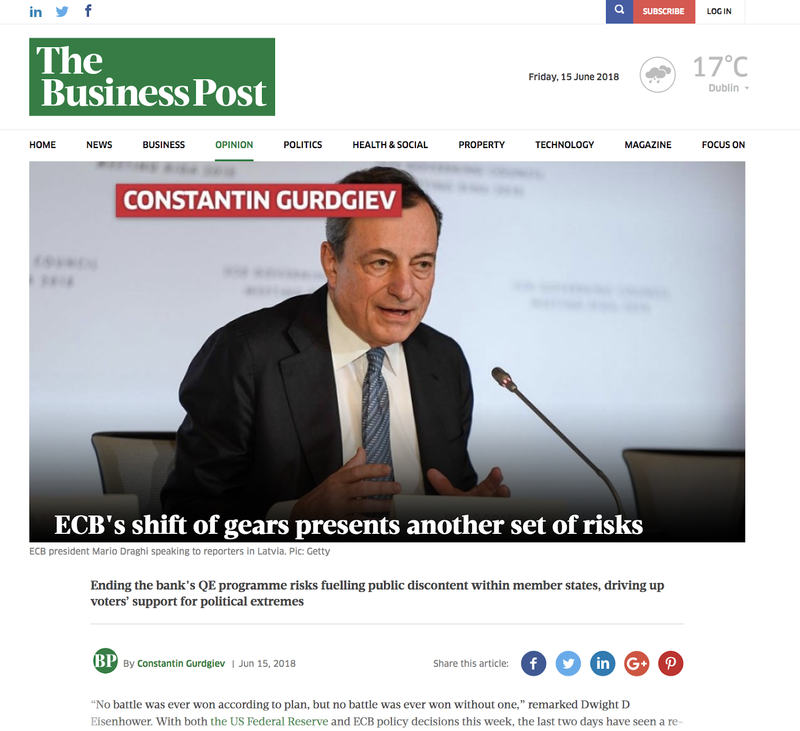 My article for Business Post from Friday covering ECB's latest announcements on QE and interest rates: https://www.businesspost.ie/opinion/ecbs-shift-gears-presents-another-set-risks-418797. 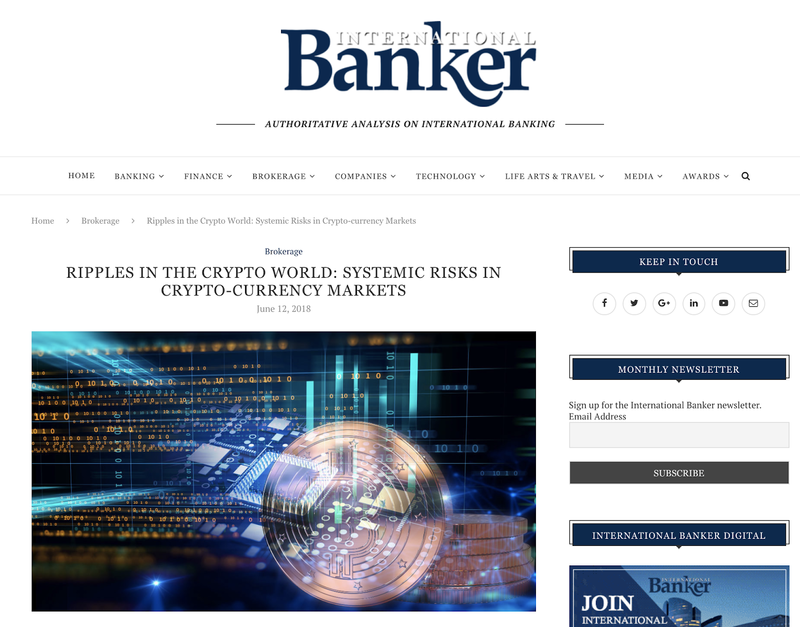 Gurdgiev, Constantin and Corbet, Shaen, Ripples in the Crypto World: Systemic Risks in Crypto-Currency Markets (June 15, 2018). 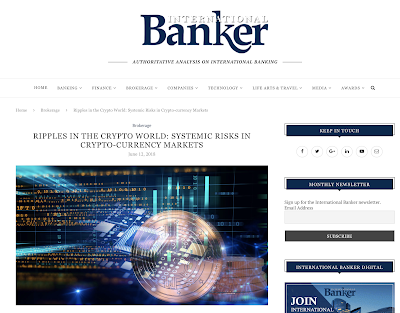 International Banker, June 2018 https://internationalbanker.com/brokerage/ripples-in-the-crypto-world-systemic-risks-in-crypto-currency-markets/ . Ungated version: https://ssrn.com/abstract=3197351. "...longstanding Italian HY issuer and mobile operator WindTre sequentially refinanced crisis-era unsecured notes at 12% coupons into 3% area coupons by January 2018, despite losing cumulative revenue and EBITDA of 30% and 25%, respectively, and re-leveraging from 4x to 6x." 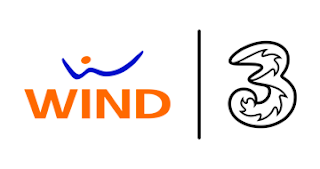 WindTre operates in the market that is highly exposed to political risks and in an economy that is posting downward revisions to growth forecasts. And the investors are piling into the company bonds, cutting the cost of debt carry for the operator from 12 percent to 3 percent. Per FT (https://www.ft.com/content/31c635f4-64df-11e8-a39d-4df188287fff): "Lending to corporates rose 1.2 per cent in the year to February 2018, according to the Bank of Italy, and the average interest rate on new loans was 1.5 per cent — a historic low." Say big, collective "Thanks!" to the folks at ECB, who worked hard to bring us this gem of a market, so skewed out of reality, one wonders what it will take for markets regulators to see build up of systemic risks. 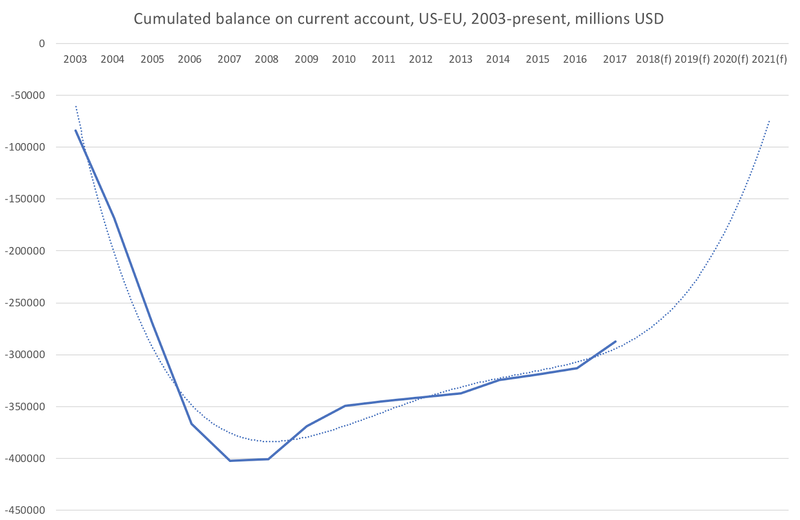 I just posted on @twitter a short thread concerning the U.S.-EU trade and payments balances from 2003 through 2017 and a trend-based forecast for same out to 2021. The thread can be accessed here: https://twitter.com/GTCost/status/1005467563034152961. Trade in services: while the U.S. is running a large (USD 153 billion dollars in 2017) deficit in goods trade with respect to the EU (and this deficit is persistent since 2003), the U.S. is running USD 51.3 billion surplus in services against the EU, and this surplus is rising (with some volatility). When trade balance is augmented by transfer payments (accounting for profits of the U.S. companies earned in the EU, less profits of the EU companies earned in the U.S., plus net transfers from the US to EU residents, including pensions payments, etc), the U.S. was running a surplus of USD14.22 billion in 2017 with respect to the EU. 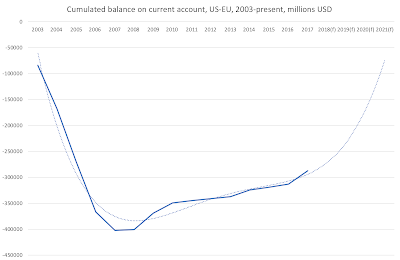 In fact, the current account balance for the U.S. with respect to the EU has been in surplus (in favour of the U.S.) since 2009, with 2008 figure being statistically zero (balance). U.S. net lending (+) or borrowing (-) from current- & capital-accounts vis-a-vis the EU has been in surplus every year since 2008. In fact, the 'New Economy' (services, IP etc) have generated a huge surplus for the U.S. when trade and income flows with the EU are accounted for. U.S. true exports to the EU are obscured by the U.S. multinationals accounting strategies that aim to minimise their tax exposures to the U.S. by engaging in extensive transfer pricing, shifting of tax base and complex offshoring of retained earnings. Were these factors taken into the account, the U.S.
Over 2009-2017 period, cumulative balance on trade in goods and services, plus primary and secondary income with the EU, stood at USD 57.3 billion in favour of the U.S. and cumulative net balance on capital and current account transactions basis was USD 112.7 billion in favour of the U.S. Prior to the G7 Summit President Trump complained in a tweet that the U.S. was running a deficit of USD 151 billion with the EU. The official figure from the U.S. Department of Commerce, however, is USD 153 billion but this figure only covers trade in goods. In simple terms, President Trump's trade war on the EU is unwarranted, dangerous, damaging to both economies and a major negative for the U.S. standing in the global economy. It is also reflective of his deeply economically illiterate understanding of the complexities of national accounts. An interesting piece of evidence, supporting the ‘productivity-labour force’ nexus of the Twin Secular Stagnations Hypothesis has been recently presented by Mary Daly, the executive vice president and Director of Research in the Economic Research Department of the Federal Reserve Bank of San Francisco (full article here: https://www.frbsf.org/economic-research/publications/economic-letter/2018/april/raising-speed-limit-on-future-growth/). First, on evidence of secular stagnation: "Average GDP growth over the 60 years preceding the Great Recession, was just under 3.5%. But if we look ahead, economists forecast numbers closer to 2%." In other words, we are looking at long term growth rate or potential growth rate that is almost 43 percent below the empirical rates of growth experienced over the last 60 years. Next: the evidence of nexus. Per Daly, to "account for the dramatic change in prospects" for future growth in the U.S. "To explain that, we need to look at the fundamental drivers of economic growth: growth in productivity and the labor force." 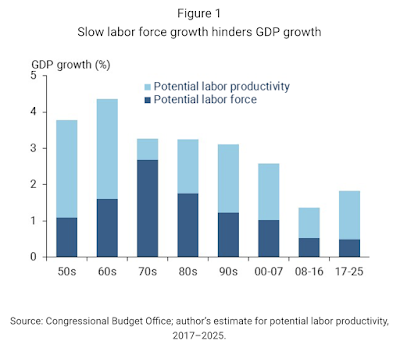 Daly notes that "productivity growth has varied over time, but since the 1980s has contributed on average about 1.5% to growth and is forecast to do the same going forward." This is, at best, incomplete. In reality, as the chart shows, productivity growth penciled in for 2017-2025 is slower than in the 1980s, 1990s, and 2000-2007. In fact, labour productivity growth in 2017-2025 is forecast to run roughly at an average rate of the 1970s, 1980s and 2008-2016. This is set against the technological revolution we are allegedly experiencing which should, all thing equal, be driving up labour productivity growth in 2017-2025 over and above the 1980s-1990s period. But, in fact, labour productivity growth contribution to GDP growth has shrunk in 2000-2007, and then again in 2008-2016 (the Great Recovery) and now set to be below the 1990s over the period 2017-2025. So all is NOT well with productivity growth. The second point, well-argued by Daly is that labour force contribution to GDP growth is shrinking and shrinking catastrophically. That is clear from the Figure above. 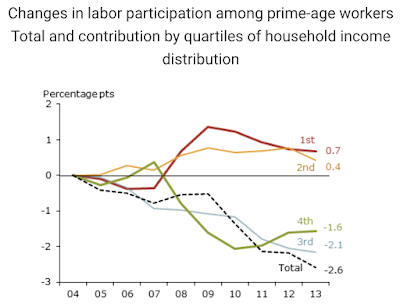 On the latter point, Daly shows that labour force participation rates (also a subject of frequent coverage on this blog), have fallen off the cliff in recent years: "We’ve also seen a drop in the level of labor force participation among workers in their prime employment years, a pattern that does look quite a bit different from other countries. Labor force participation in the United States for prime-age workers reached a peak in the late 1990s and then took a steep dive in the 2001 recession. In the 2007 recession, it took an even steeper tumble, reaching a low point in 2015... While we have seen improvements since, they have been modest. So today, the share of men and women in their prime working years who are employed or actively searching for a job is far lower than it was in the 1990s." So, Daly asks a very important question: "Why aren’t American workers working?" And proceeds to give an interesting explanation: "research by a colleague from the San Francisco Fed and others suggests that some of the drop owes to wealthier families choosing to have only one person engaging in the paid labor market (Hall and Petrosky-Nadeau 2016)." 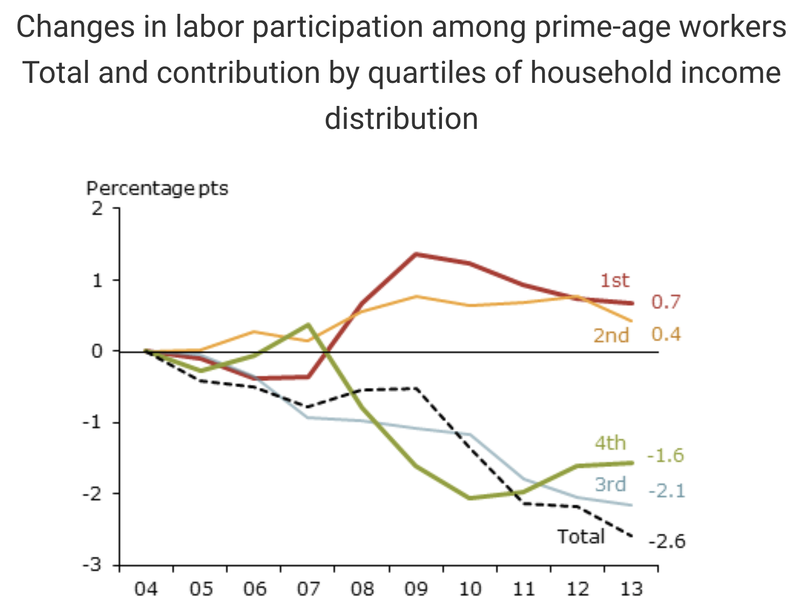 Observe that the deepest reduction in labour force participation is for the 3rd quartile of income earners. How much do these families earn? "In 2013, households in the lowest 25% of the income distribution, or the first quartile, had an average monthly income of less than $1,770. The median total household monthly income was $3,430. At the top of the distribution, the lower bound for being in the highest 25% of households, or the fourth quartile, was a monthly income of $5,993." Now, can you imagine in these modern days a household earning less that $5,993 per month in pre-tax income being able to afford not to engage the second partner in work? Personally, I can't. Unless these households benefit from huge transfers via inheritance or within-family housing subsidies, etc. But... per same paper, "On average in 2013, the upper-level households derived about 96% of their monthly income from working. For households in the poorest quartile, earnings made up about 62% of monthly income, while another 23% came from unemployment compensation, social security, supplemental social security, and food stamps." 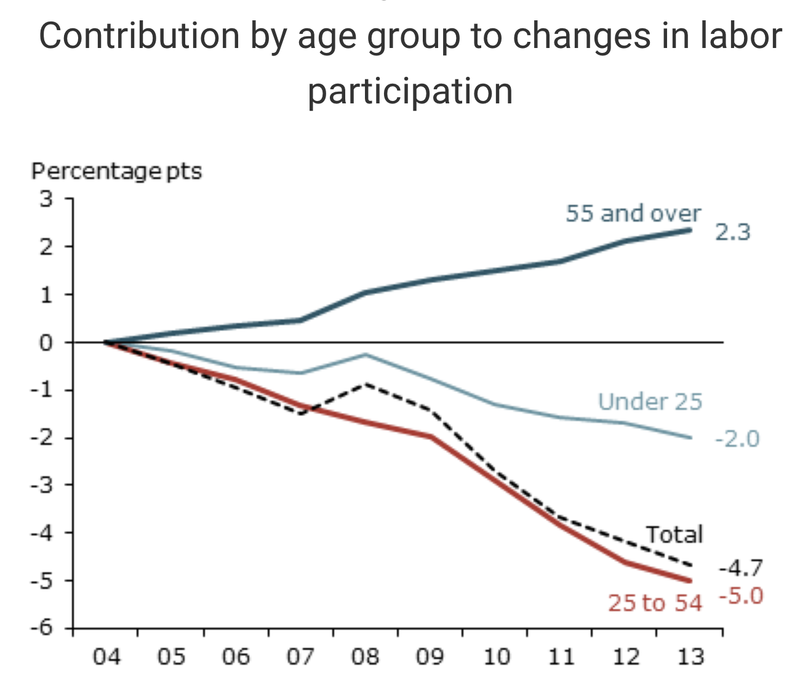 Which means that these very same households that, apparently, voluntarily withdrawing labour force participation, are not gaining much from non-labour income transfers. So, these volunatry exits from the labour force are, apparently, impacting households more dependent on labour income AND not the highest income quartile households. Something is fishy. This too shows that something is fishy in the data. Households in 55+ age group are more likely to have higher incomes. They are increasing labour force participation despite the fact that it is harder for them to gain quality jobs due to age effects. 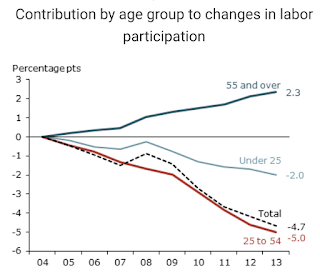 Households in 25-54 age bracket are exiting the workforce, just at the time when their earnings from work should be rising and just in time when they need to service student loans, mortgages, schooling for kids, pensions etc. Again, the evidence presented simply contradicts the arguments made: both age cohorts and income cohorts analysis does not appear to support the proposition that families are voluntarily exiting the labour force, reducing their labour income to single source provision. I am not buying this. The fact that the 3rd quartile of families are exiting the workforce is not a sign of preferences for leisure or household employment. It is, rather, a sign that the jobs market is no longer promising for the upper-middle classes, especially for the younger workers. It is a sign that families are increasingly reliant on familial transfers for housing and contingent workforce employment, both under-reported to the official stats gatherers. Daly hints at this in her reference to the 'second factor' driving decline in labour force participation: the disappearance of the mid-level skills jobs, including the decline due to automation: "A growing body of research finds that these pressures on middle-skilled jobs leave a big swath of workers on the sidelines, wanting work but not having the skills to keep pace with the ever-changing economy". Now, that hits the target far better than the argument that people are just exiting workforce to have good times and home-school their kids. And worse, Daly is also on the money when she points out that the U.S. system is woefully inadequate when it comes to provisions for investing in human capital: "Like in most advanced economies, job creation in the United States is being tilted toward jobs that require a college degree (OECD 2017). Even if high school-educated workers can find jobs today, their future job security is in jeopardy. Indeed by 2020, for the first time in our history, more jobs will require a bachelor’s degree than a high school diploma (Carnevale, Smith, and Strohl 2013)." Yet, "although the share of young people with four-year college degrees is rising, in 2016 only 37% of 25- to 29-year-olds had a college diploma (Snyder, de Brey, and Dillow 2018). 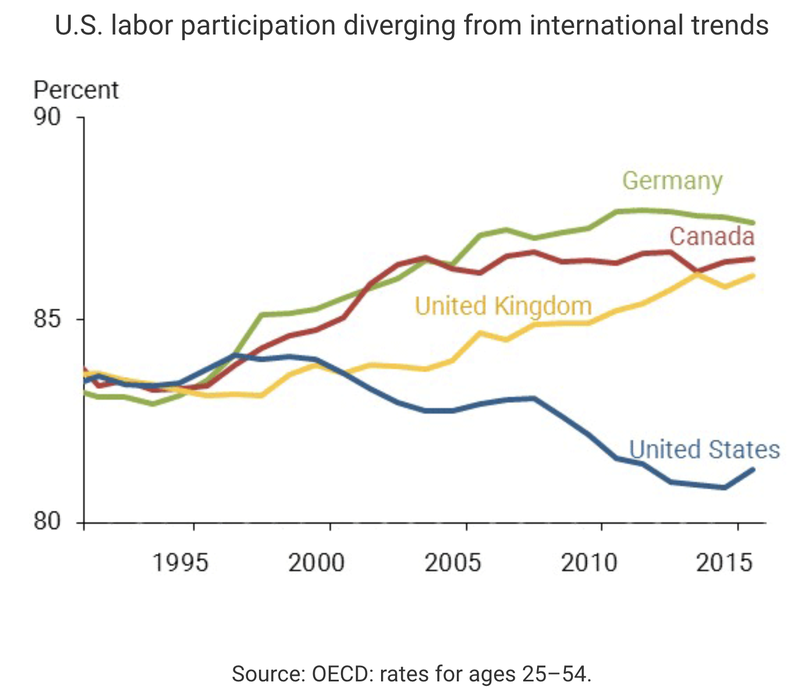 This falls short of the progress in many of our international competitors (OECD 2018), but also means that many of our young people are underprepared for the jobs in our economy." There are added dimensions / nuances to this. Some of the U.S. college education is of questionable quality, compared to more evenly-distributed quality of college education in Europe, Japan and Australia. Top Universities deliver top tier output. But for-profit colleges and some lower-end school deliver nothing worth talking about. A 4-year system of undergraduate education is effectively a correction on already poor quality high schools output, requiring the first year of college to be a remediation year to compensate for the lack of proper standards in secondary education. Two-year masters programs are, then, designed to take the first year to correct for the shortfalls in education quality in undergraduate levels. And so on. In effect, the U.S. higher education system is designed to inflict maximum financial damage (via costs and debt of year 1 education in undergraduate and post-graduate systems), while taking a cut of two years from the graduates careers. This is similar to what Italian system delivers, except in the case of Italians, it delivers also higher quality content in secondary and undergraduate education, taking longer time to learn more. And so on. In simple terms, as Daly tacitly acknowledges, the U.S. economy is racing toward higher degree of automation and greater skills intensity, while running low on human capital investments. The solution to this historical problem has been to import younger, smarter foreigners via a range of schemes - from graduate schools admissions to H1Bs. But this solution is not sufficient to correct for the rate of acceleration in skills intensity. And it is not functioning in redressing training and skills gaps that already exist in the economy. Daly notes that one important aspect of change must touch upon the need to "equalize educational attainment across students of different races and ethnicities." This, undoubtedly, is one key factor in attempting to address the human capital investment gaps. The problem, of course, is how does one achieve this? Historically, the U.S. States have gone about the problem by lowering standards and quality of secondary education curriculum for all students. They also increased quotas-based admissions for minorities. The former does nothing for actually stimulating investment in human capital. The latter creates a zero-sum game out of education system, unless new investments go into college education provision. Which is not happening, despite rampant price inflation in higher education. Daly makes a strong case for more investment in college education. But she does not make the equally important case that such investment must start at pre-primary level and work through a combination of increased resources and higher standards across all grades and for all students. She correctly states that "In the parlance of economics, education is incentive compatible, good for everyone involved", when it comes to students, taxpayers and the economy. But she does not recognise that better education is not incentive-compatible for one key set of participants in the market: teachers and schools administartors. In fact, in primary and secondary education systems, in the U.S., incentives for teachers are aligned toward delivering more standardised, less rigorous, less-transparent in quality, outcomes, such as rota learning and teaching-to-test. Daly says nothing as to how this problem can be addressed, despite the fact that all past reforms of the U.S. education system were led by teachers and their Unions, not by parents or other economic agents. Finally, there is a problem of generational cohorts. Any investment in education system today will hold promise of altering the status quo of human capital investments for the cohorts of those under the age 30 (given the levels of debt accumulated by the recent graduates, probably for those under the age of 25). Which leaves the rest of the households - the vast majority of them, in fact - just where we have them today: under-skilled, facing the risk of their existent human capital depreciation to automation, etc. Formal education cannot address these problems systemically. Take an argument ad absurdum as an illustration. Suppose we invest enough funding into the current higher education system to provide 100% college graduation for those current under 25 years of age. Suppose we even fix the quality vs quantity problem in the U.S. education system. This will improve the productivity and jobs prospects for the very young. 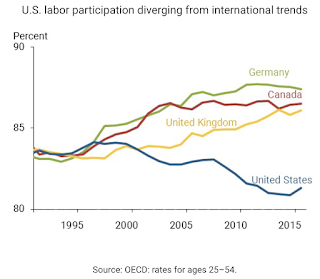 But it will make the older generations of workers (older = 25 years of and above) even less competitive, leading to further reductions in their incomes, career prospects and labor force participation rates. Have we fixed anything when it comes to the Twin Secular Stagnations Hypothesis? Not really. Have we addressed the polarisation gap between life-cycle earnings of the lower earners and higher earners (the dropping-out of the U.S. middle class)? Not really. Have we done anything to alleviate political disillusionment amongst the U.S. voters with the economic system that reduces their social and economic mobility? Not really. So even in ad absurdum case of Daly-proposed solution success, we have fixed little if nothing at all. We, in fact, might have made the disease more deadly. In sum, we do need more investment in education. But we also need smarter education systems reforms. And we need a parallel investment in increasing human capital investments for those already in the labour force, and those of older age cohorts who have been dropping out of it. We need a systemic approach to addressing skills depreciation arising from automaton. And we need a systemic approach to tackling economic value-added displacement away from labour, toward pure profits and technological capital. The longer we delay these major, pivotal reforms, the bigger the problem of the secular stagnation gets. I have recently written about rising firm power in labour markets, driven by monopsonisation of the markets thanks to the continued development of the contingent workforce: http://trueeconomics.blogspot.com/2018/05/23518-contingent-workforce-online.html. 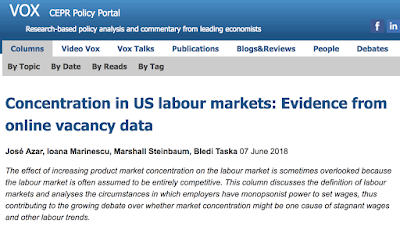 In this, I reference a new paper "Concentration in US labour markets: Evidence from online vacancy data" by Azar, J A, I Marinescu, M I Steinbaum and B Taska. The authors have just published a VOX blog post on their research, worth reading: https://voxeu.org/article/concentration-us-labour-markets. 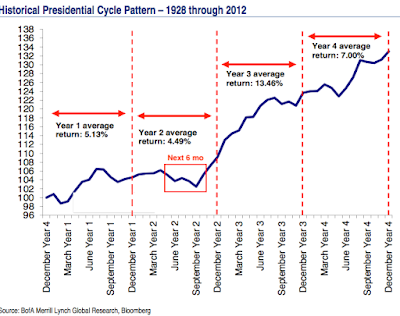 Cyclicality in markets returns and political environment is an interesting and under-researched topic. Here is a great post on the subject: https://fat-pitch.blogspot.com/2018/05/trading-worst-6-months-and-presidential.html. In my previous post, I talked about the Too-Big-To-Fail Euro state, #Italy - a country with massive debt baggage that is systemic in nature. 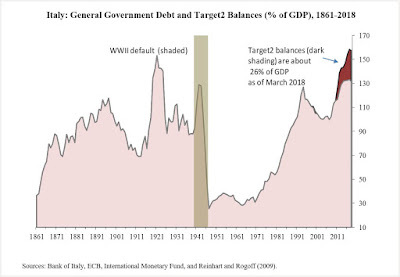 Here is Project Syndicate view from Carmen Reinhart: https://www.project-syndicate.org/commentary/italy-sovereign-debt-restructuring-by-carmen-reinhart-2018-05. 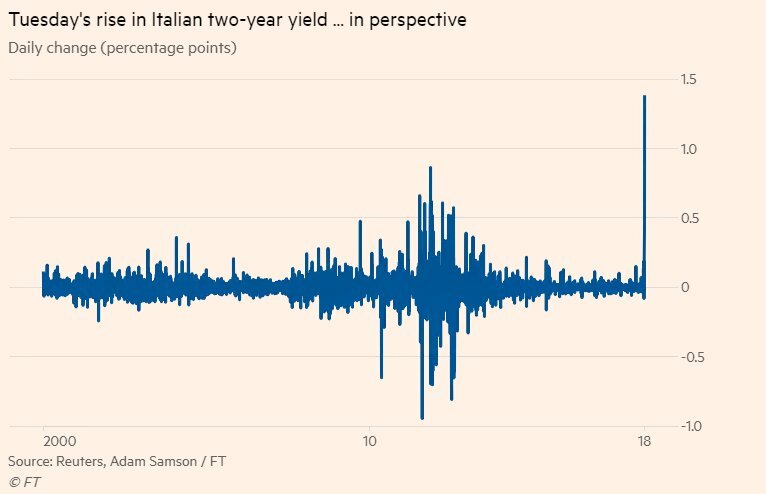 Quote: "With many investors pulling out of Italian assets, capital flight in the more recent data is bound to show up as an even bigger Target2 hole. This debt, unlike pre-1999, pre-euro Italian debt, cannot be inflated away. In this regard, it is much like emerging markets’ dollar-denominated debts: it is either repaid or restructured." 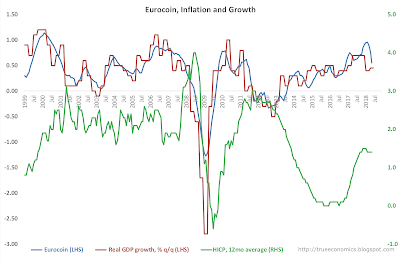 The problem, of course, is the ECB position, as mentioned in my article linked above. It is more than a reputational issue. Restructuring central bank liabilities is easy and relatively painless when it comes to a one-off event within a large system, like the ECB. So no issue with simply ignoring these imbalances from the monetary policy perspective. 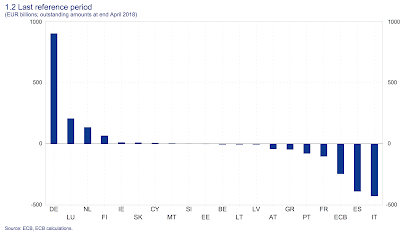 However, the ECB is a creature of German comfort, and this makes any restructuring (or ignoring) of the Target 2 imbalances a tricky issue for ECB's ability to continue accumulating them vis-a-vis all other debtor states of the euro area. Should a new crisis emerge, the ECB needs stable (non-imploding) Target 2 balance sheet to continue making an argument for sustaining debtor nations. This means not ignoring Italian problem. 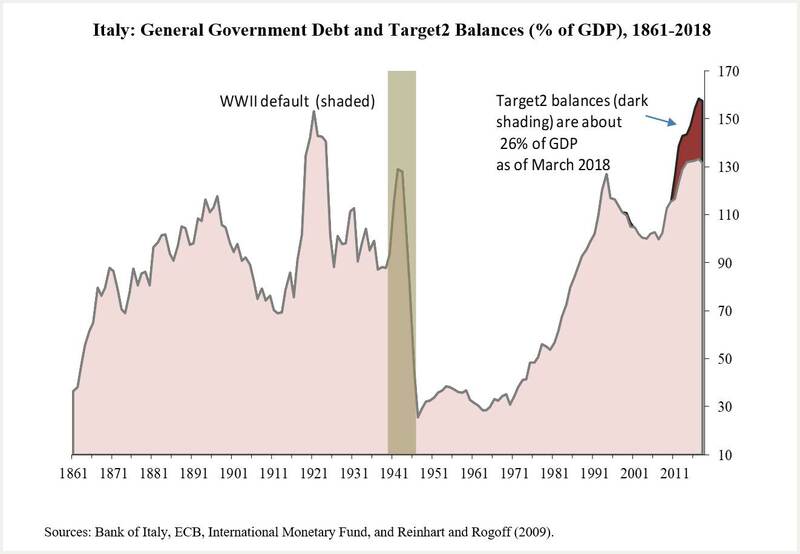 Reinhart warns, in my opinion correctly, "In the mildest of scenarios, only Italy’s official debt – held by other governments or international organizations – would be restructured, somewhat limiting the disruptions to financial markets. Yet restructuring official debt may not prove sufficient. Unlike Greece (post-2010), where official creditors held the lion’s share of the debt stock, domestic residents hold most of Italy’s public debt. 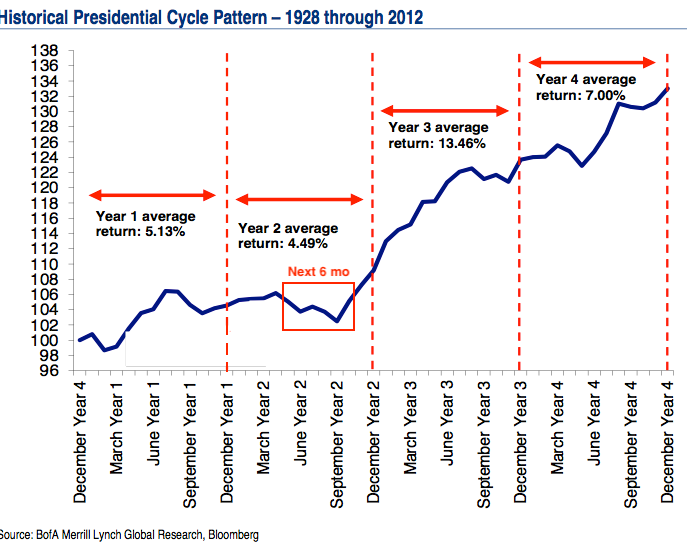 This places a premium on a strategy that minimizes capital flight (which probably cannot be avoided altogether)." In other words, as I noted years ago, Italy is a 'Too-Big-To-Fail' and a 'Too-Big-To-Save' or TBTF/TBTS problem for the euro area. 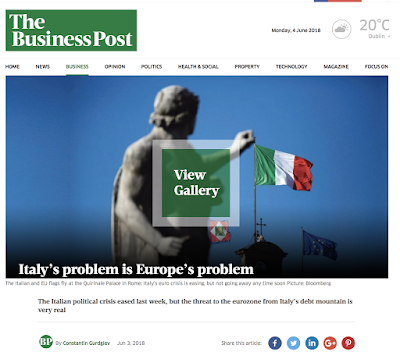 My article on Italian (and Spanish and Dutsche Bank) mess in Sunday Business Post: https://www.businesspost.ie/business/italys-problem-europes-problem-417945. This fortnight has been a real roller-coaster for the European markets and politics. Only two weeks ago, I wrote about the problems of rising political populism in Italy and Spain as the signals of a broader trend across the block’s member states. This week, in Spain a no confidence motion in Mariano Rajoy’s rule played a side show to Rome’s drama. The timeline of events in Italy provides the background to this week’s lessons. The country has been governed by a lame-duck executive since mid-2016. Fed up with Rome’s gridlock, in March 2018 general election, Italians endorsed a parliament split between the populist-Left M5S and the far-Right group of parties led by the League. Month and a half of League-M5S negotiations have produced a shared policies platform, replete with radical proposals for reshaping country’s Byzantine tax and social welfare systems. The platform also contained highly controversial proposals to force the ECB to write down EUR250 billion worth of Government debt, a plan for restructuring fiscal rules to allow the country to run larger fiscal deficits, and a call for immigration system reforms. On Monday, the President of the Italian Republic, Sergio Mattarella, a loyal Euro supporter, vetoed the League-M5S candidate for the economy ministry, Eurosceptic Paolo Savona. The result was resignation of the League-M5S Prime Minister-designate, Giuseppe Conte, and a threat of an appointment of the unpopular technocrat, Carlo Cottarelli, an ex-IMF economist nicknamed Mr. Scissors for his staunch support for austerity, as a caretaker Prime Minister. By Thursday night, Conte was back in the saddle, with a new coalition Government agreed and set to be sworn in on Friday. Crisis avoided? Not so fast. The markets followed the political turns and twists of the drama. On Tuesday, Italian bonds posted their worst daily performance in over 20 years. The spike in the 2-year bond yield was spectacular, going from 0.3 percent on Monday morning to 2.73 percent on Tuesday, before slipping back to 1.26 percent on Thursday. 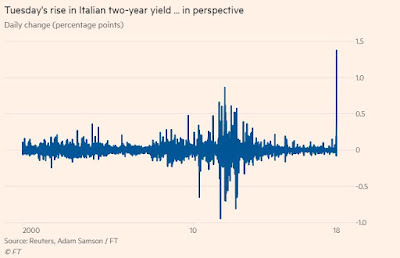 The 10-year Italian bond yield leaped from 2.37 percent to 3.18 percent within the first two days, falling to 2.84 percent a day after. 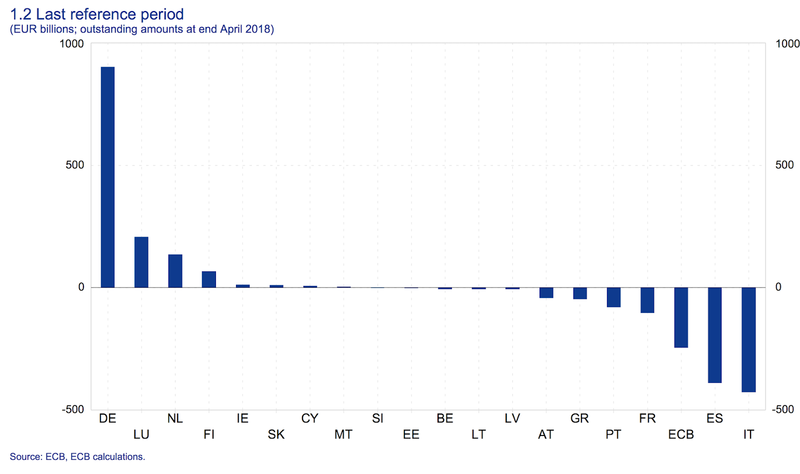 To put these bond yields’ movements into perspective, at the week’s peak yields, the cost of funding Italian EUR2.256 trillion mountain of Government debt would have risen by EUR45 billion per annum - more than the forecast deficit increases under the reforms proposed in the League-M5S programme. Thus, despite the immediate crisis yielding to the new Coalition, a heavy cloud of uncertainty still hangs over the Euro area’s third largest member state. Should the new Government fail to deliver on a unified platform built by an inherently unstable coalition, the new election will be on offer. This will likely turn into a plebiscite on Italy’s membership in the Euro. And it will also raise a specter of another markets meltdown. The lessons from this week’s spike in political uncertainty are three-fold. All are bad for Italy and for the entire euro area. Firstly, after years of QE-induced amnesia, the investment markets are now ready to force huge volatility and rapid risk-repricing into sovereign bonds valuations. Secondly, despite all the talk in Brussels and Rome about the robustness of post-2011 reforms, the Italian economy remains stagnant, incapable of withstanding any significant uptick in the historically-low borrowing costs that prevailed over recent years, with its financial system still vulnerable to shocks. Thirdly, the feared contagion from Italy to the rest of the Eurozone is not a distant echo of the crises past, but a very present danger. Italy’s debt mountain is the powder keg, ready to explode. The IMF forecasts from April this year envision Italian debt-to-GDP ratio dropping from 131.5 percent at the end of 2017 to 116.6 percent in 2023. However, should the average cost of debt rise just 200 basis points on IMF’s central scenario, hitting 4 percent, the debt ratio is set to rise to 137 percent. This Wednesday bond auction achieved a gross yield of 3 percent on 10-year bonds. In other words, Italy’s fiscal and economic dynamics are unsustainable under a combination of higher risk premia, and the ECB monetary policy normalisation. The risk of the former was playing out this week and will remain in place into 2019. The latter is expected to start around November-December and accelerate thereafter. With the government crisis unfolding, the probability of Italy leaving the Euro within 12 months, measured by Sentix Italexit index jumped from 3.6 percent at the end of the last week to 12.3 percent this Tuesday before moderating to 11 percent at the end of Thursday. This puts at risk not only Italian Government bonds, but the private sector debt as well, amounting to close to EUR2 trillion. A rise in the cost of this debt, in line with Government debt risk scenarios, will literally sink economy into a recession. As Italian Government bonds spreads shot up, other European markets started feeling the pain. Based on the data from Deutsche Bank Research, at the start of 2018, foreign banks, non-bank investors and official sector, including the Euro system, held ca 48 percent of the Italian Government debt. In Spain and Portugal, this number was closer to 65 percent. In other words, the risk of falling bonds prices is both material and broadly distributed across the European financial system for all ‘peripheral’ Euro states. As a part of its quantitative easing program, the ECB has purchased some EUR250 billion worth of Italian bonds. A significant uptick in risk of Italy’s default on these bonds will put political pressure on ECB. Going forward, Frankfurt will face greater political uncertainty in dealing with the future financial and fiscal crises. 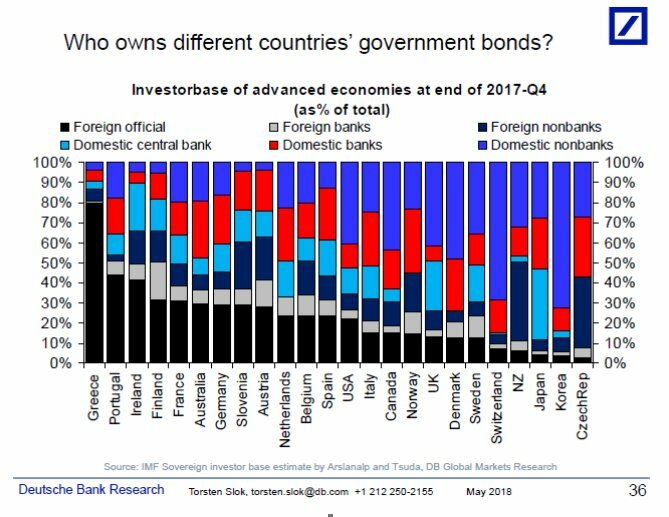 Research from the Bank for International Settlements puts Italian banks’ holdings of Government bonds at roughly EUR 450 billion. Ten largest Italian banks have sovereign-debt exposures that exceed their Tier-1 capital. As the value of these bonds plunges, the solvency risks rise too. Not surprisingly, over the last two weeks, shares of the large Italian banks fell 10-20 percent. These declines in equity prices, in turn, are driving solvency risks even higher. Beyond the Italian banks, French financial institutions held some EUR44 billion worth of Italian bonds, while Spanish banks were exposed to EUR29 billion, according to the European Banking Authority. The second order effects of the Italian risk contagion play through the other ‘peripheral’ euro area bonds. As events of this week unfolded, in line with Italy, Spain, Portugal and Greece have experienced relatively sharp drops in their bonds values. All three are also subject to elevated political uncertainty at home, made more robust by the Italian crisis. 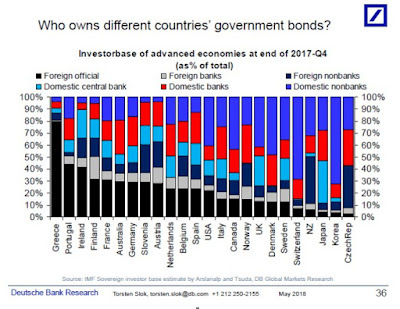 Thus, if the Italian government bond yields head up, banks’ balance sheets risks mount through both, direct exposures to the Italian Government bonds, and indirect effects from Italian contagion on the broader government debt markets, as well as to the private sector lending. At the end of this week, all indication are that the Italian contagion crisis is receding. The new risk triggers are shifting out into late 2018 and early 2019. 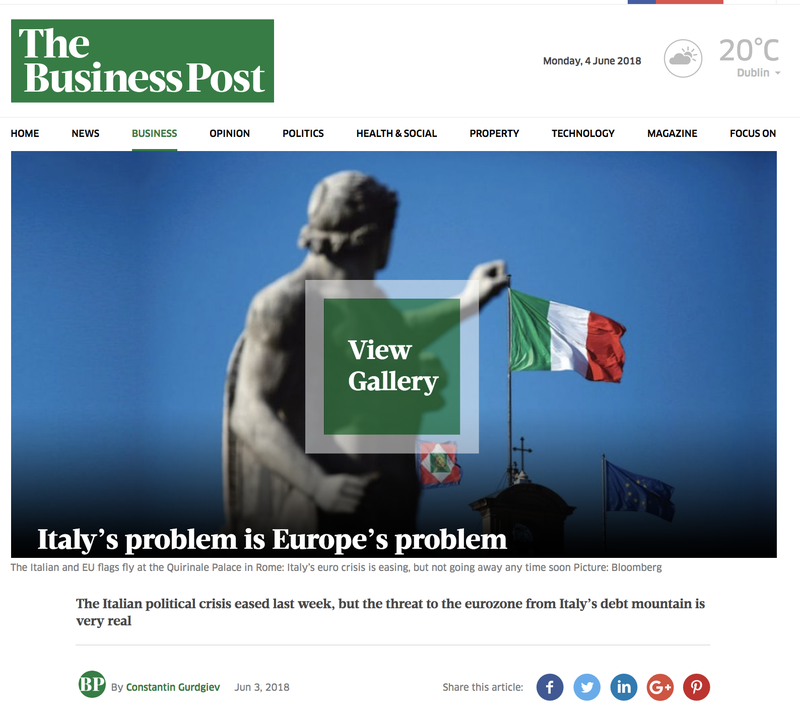 The uneasy coalition between two populist moments, the M5S and the League, is unlikely to survive the onslaught of voter dissatisfaction with the state of the economy and continued immigration crisis. At the same time, the coalition will be facing a highly skeptical EU, hell-bent on assuring that M5S-League Government does not achieve much progress on its reforms. All in, the new Government has between six and twelve months to run before we see a new election looming on the horizon. The Italian crisis might be easing, but it is not going away any time soon. Neither the Spanish one. Oh, and with a major credit downgrade from the Standard & Poor’s and the U.S. Fed, here goes the systemic behemoth of European finance, the Deutsche Bank.